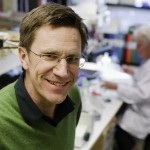 “A similar cell type has been identified in several other organs where it can promote regeneration of muscle, bone, cartilage, and adipose tissue,” said Patrik Brundin, M.D., Ph.D. (pictured), Jay Van Andel Endowed Chair in Parkinson's Research at Van Andel Research Institute (VARI), Head of the Neuronal Survival Unit at Lund University, and senior author of the study. The study is of interest to a broad spectrum of brain research. Future possible therapeutic targets range from neurodegenerative diseases to stroke. Illustration: Van Andel Research Institute.